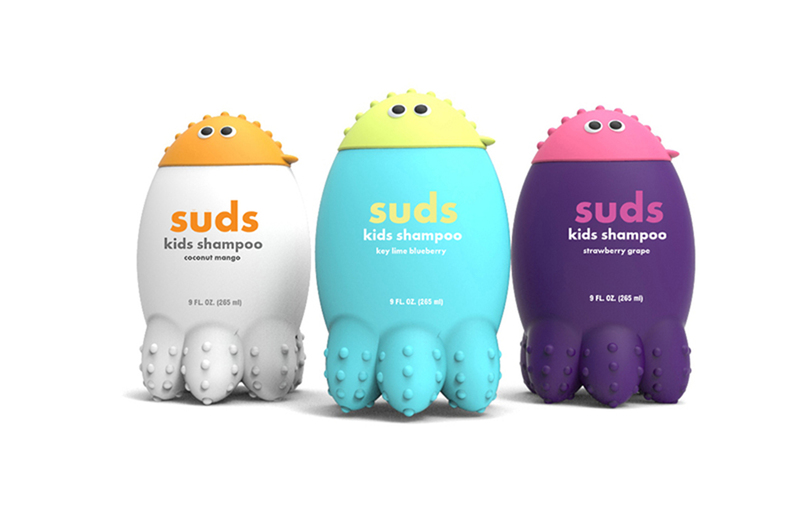 Suds are a line of shampoos for kids featuring appealing scents in friendly and fun (plastic) packaging. Kids will love the silly, squid-like characters and parents will appreciate having a minimal and modern packaging design in their bathroom. Combining a child's hygiene product with amazing scents in a quirky and playful package will make Suds fly off the shelf! Most of the kids shampoos on the market today feature busy and excessive packaging designs, while not many utilize creative shapes and forms. The bumpy texture of the squid's limbs are fun to touch and run your fingers over, and also double as a slip-resistant surface. There are many more character possibilities, making Suds one of the most appealing bath concepts for kids.